Posted in Events, Uncategorized | Comments Off on March with QuAIA at Pride! Queers Against Israeli Apartheid congratulates Toronto’s LGBT community for successfully reversing censorship at the 2010 Pride Parade. Pride Toronto announced today that it would not censor the term ‘Israeli apartheid’ from the parade. 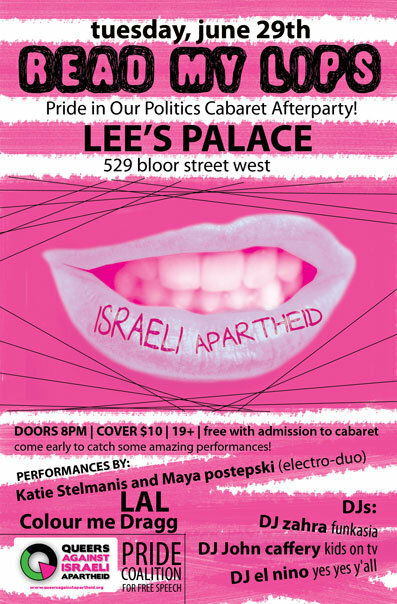 In May, Pride Toronto had announced that it would censor the term in response to pressure from the City of Toronto and Israel lobby groups. In response, Dr. Alan Li rejected the title of grand marshal for the 2010 parade and Jane Farrow refused her appointment as Honoured Dyke. 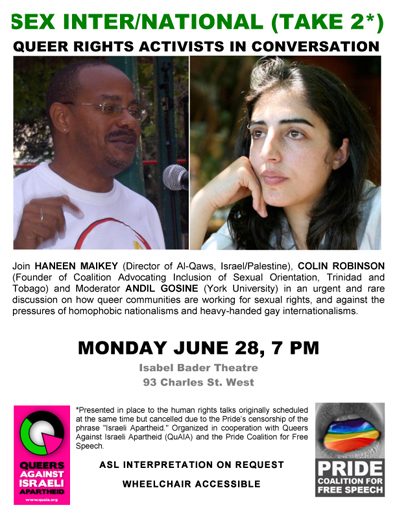 The decision to censor Queers Against Israeli Apartheid was met with widespread condemnation from the LGBT community, including Olympic gold medalist Mark Tewksbury, the 519 Church Street Community Centre, Buddies in Bad Times Theatre and 23 current and former Pride honourees, who returned their awards in protest. 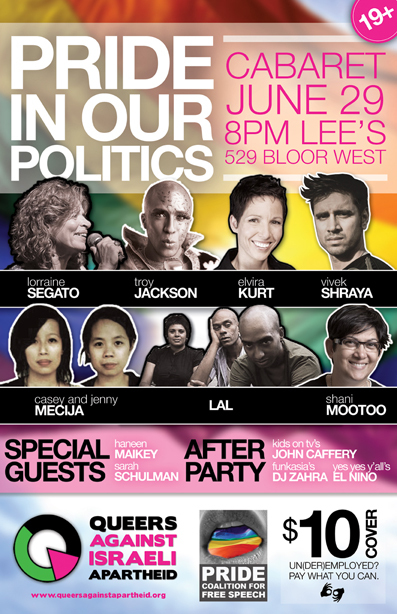 The members of Queers Against Israeli Apartheid (QuAIA) are heartened and deeply grateful for the tremendous solidarity and support shown by the LGBT community and allies since the words “Israeli Apartheid” were censored by Pride Toronto, excluding our group and our message as a result of pressure from external lobby groups. Many people have asked us what we are calling on supporters to do. To perfomers and artists at Pride, we repeat our earlier call: please get in touch with us at quaia.toronto@gmail.com to let us know what you are prepared to do, so that we can make a call for coordinated action that will have the greatest impact. We are not at this time calling for a general boycott of Pride, though we are very thankful to all artists and speakers who have withdrawn from the festival on principle. For the Pride parade, QuAIA is asking supporters to do whichever of the following actions they are able to do. We recognize that people have different pressures on them, and different levels of comfort with these actions, and respect the choices that people will make. As of yet, QuAIA’s application to march has not been formally rejected. Whether it is rejected or not, we will be marching with our message. Pride belongs to us as much as to other queers. We call on all those who are able to join with us in our contigent at Pride. We will release further details as these become available. If you would like to march with us, send us an email at quaia.toronto@gmail.com. If you are marching in another contingent, or performing, speaking, or participating in other Pride events, we ask you to carry our message. We will have stickers, buttons, and t-shirts available for distribution. If your group would like to wear our materials, or make a contribution to help us produce them, please contact us at quaia.toronto@gmail.com. 3. Defy censorship and support free speech by using the banned words “Israeli apartheid” in the Trans and Dyke Marches, the Pride Parade, and throughout Pride week. We are asking those who are not comfortable using the banned words in any way to carry an anti-censorship message or symbol. You are currently browsing the Queers Against Israeli Apartheid blog archives for June, 2010.